Be the first to share your favorite memory, photo or story of Jean M.. This memorial page is dedicated for family, friends and future generations to celebrate the life of their loved one. 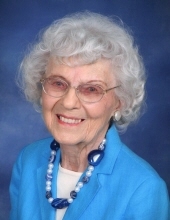 Jean M. Hartman, 96, died January 30, 2019. She was born July 30, 1922 in Chambersburg, PA. She was the daughter of the late Reuben and Edith (Kanaga) Morgan of Shippensburg, PA. Jean was married for 56 years to the late Eugene R. Hartman who died March 20, 2000. Jean was also predeceased by her sister, Betty (Morgan) Dittmann. She graduated from Shippensburg High School in 1940 and graduated from Shippensburg State Teachers College in 1946. She taught in the Gettysburg Elementary Public School System for thirteen years. She was an active member of St. James Lutheran Church in Gettysburg and was a former Sunday School teacher and member of the Church Council. She was a former member of the Pennsylvania Lawyers’ Wives Association and served as their State Secretary and Treasurer for three years. She was a former member and Secretary of the Gettysburg Women’s Club, a former member and board member of AARP #2635. She was a 65 year member of Eastern Star #392 and the Samaria Shrine #43. Surviving are two sons, Gary E. Hartman of Gettysburg and Jack M. Hartman of York, three grandchildren, Brad Hartman, Brooke Barrett and Kara Clugston, and three great-grandchildren, Hunter Barrett and Alyvia and Maya Clugston. Gene and Jeannie, as they were known among their friends, enjoyed dancing, bridge and golf. Services will be held on Tuesday, February 5, 2018 at 11 AM at St. James Lutheran Church, Gettysburg, PA. There will be Visitation at the church from 10 AM until the time of the Services. "Email Address" would like to share the life celebration of Jean M. Hartman. Click on the "link" to go to share a favorite memory or leave a condolence message for the family.